Piezosurgery (piezoelectric bone surgery) is a technique of bone surgery which is gaining popularity in the field of dentistry in the recent years. This device is being used in osteotomies, periodontology and implantology, and oral surgical procedures. Piezoelectric ultrasonic vibrations are utilized to perform precise and safe osteotomies. This article discusses the equipment, biological effects on bone, and advantages and disadvantages of this technology. Periodontitis is a chronic inflammatory disease of the supporting tissues of the teeth. This disease is associated with crestal bone resorption which alters the morphology of the alveolar process and also produces reverse osseous architecture at times, which significantly hinders the removal of bacterial plaque. The treatment is largely based on the removal of local factors and restoration of the bony architecture. Traditionally, osseous surgery has been performed by either manual or motor-driven instruments. However, both these methods have their own advantages and disadvantaes. Manual instruments offer good control when used to remove small amounts of bone in areas with relatively less dense mineralization. However, they are difficult to control in cortical bone, particularly where precise osteotomies are essential. As a consequence, they are mostly applied for gross cutting of larger bone segments. Motor-driven instruments are often used when bone is very dense. They transform electric or pneumatic energy into mechanical cutting action using the sharpened edge of burs or saw blades. These instruments generate a significant amount of heat in the cutting zone that must be minimized by water irrigation. Overheating of adjacent tissue may alter or delay the healing response. Reduced rotational speed decreases not only frictional heat but also cutting efficiency. Motorized cutting tools also decrease tactile sensitivity. Slower rotational speed necessitates increased manual pressure, which increases the macrovibration of the cutting tool and further diminishes sensitivity. Microultrasonic instruments have been developed with the aim of improving root surface debridement. Piezosurgery (PS) (Mectron Medical Technology, Carasco, Italy) uses piezoelectric ultrasonic vibrations to perform precise and safe osteotomies. Moreover, it reduces damage to osteocytes and permits good survival of bony cells during harvesting of bone. Recently, autologous bone that had been harvested by different methods (round bur on low and high-speed handpiece, spiral implant bur on low-speed handpiece, safe scraper, Rhodes back action chisel, rongeur pliers, gouge-shaped bone chisel, and piezoelectric surgery) was examined using microphotography and histomorphometric analysis that evaluated particle size, percentage of vital and necrotic bone, and the number of osteocytes/unit of surface area. The results showed that the best methods for harvesting vital bone are gouge-shaped bone chisel, back action, en block harvesting, rongeur pliers, and piezoelectric surgery. Bone that has been harvested with a round bur on low- and high-speed handpieces, a spiral implant bur, or safe scrapers, is not suitable for grafting because of the absence of osteocytes and the predominance of nonvital bone. Piezoelectric devices usually consist of handpiece and foot switch that are connected to the main power unit. This has a holder for the handpiece and contains irrigation fluids that create an adjustable jet of 0–60 ml/min through a peristaltic pump removing debris from the cutting area and maintains a blood-free operating area because of cavitation (production of imploding bubbles) of the irrigation solution giving greater visibility particularly in complex anatomical areas by dispersing coolant fluid as an aerosol [Figure 1]., The instantaneous frequency is generally automatically controlled in response to the pressure load on the tip. The parameters under the control of the operator, apart from the pressure applied, are the pulse frequency (when available), the rate of delivery of coolant fluid, and the applied power, which in some instruments is limited to 3–16 W and in others has a maximum of as much as 90 W. In most instruments, power is controlled by selecting the type of bone to be cut or the procedure to be performed. The peak-to-peak amplitude of tip oscillations, typically in the range of 30–200 mm in the plane perpendicular to the shaft of the working piece (some instruments also or exclusively oscillate along the shaft), ensures precise microabrasive incision. The piezoelectric system is based on the fact that certain crystalline structures such as quartz will be subject to a change in shape when placed within an electric field. If an alternating voltage at an ultrasonic frequency is applied across a piezoelectric crystal, it will result in an oscillating shape change of the crystal at the frequency applied. The resultant vibration produces tip movement that is primarily linear in direction and generally allows only 2 sides of the tip to be active at any time [Figure 2]. At present, the most widely used piezoelectric material is lead zirconate titanate., The piezoelectric unit operates in the 25–50 kHz range and is activated by dimensional changes in crystals housed within the handpiece, as electricity is passed over the surface of the crystals resulting in more favorable osseous repair and remodeling in comparison with carbide and diamond burs. 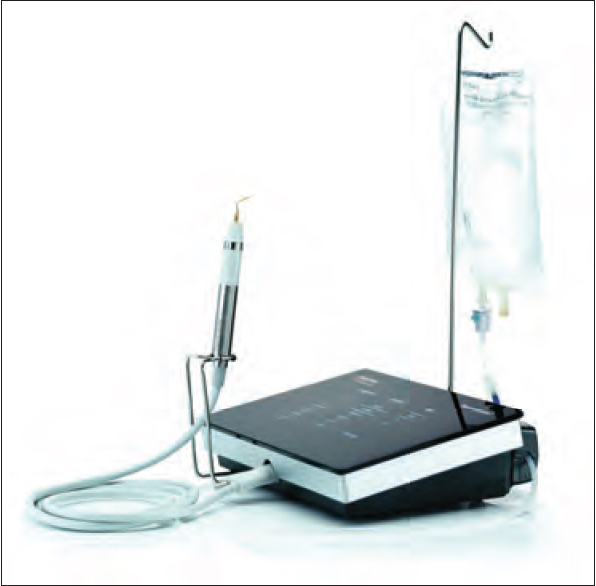 Piezoelectric equipment can be used for endodontic surgery (removing root canal fillings and fractured instruments from root canals), periodontology and implantology (scaling subgingival plaque, ostectomy and osteoplasty procedures to create positive physiologic architecture of bone support of the involved teeth, bone grafting of an infrabony periodontal defect, implant site preparation, implant removal, crestal bone splitting, bone osteotomy or corticotomy, harvesting bone blocks and bone grafting, sinus lift procedure, ridge augmentation, and ridge expansion), tooth extraction, cystectomy, maxillofacial surgery, surgical orthodontic surgery, otological surgery, neurosurgery, orthopedic, and hand surgery. The advantages of the piezo-osteotomy can also be applied to preimplantologic surgery for augmentative purposes, for example, sinus floor elevation carries a much lower risk of perforation or injury to the mucous membrane since soft tissues cannot be damaged with this method.,, and also auto transportation of unerupted third molars. Safe, in as much as the reduced range of the micrometric vibrations, offers the possibility to perform surgery with very great precision. The cut, in fact, could be controlled as easily as if drawing an outline. This enables osteotomy to be performed even in close proximity to delicate structures, such as vasculo-nervous structures, in general, without damaging them. Boosted-mode indicated in bone surgery, necessary in performing osteotomy and osteoplasty. Experience and repeating of the movements form the basis of surgical movements and this is the principal element to be taken into consideration when starting to use PS. In fact, in piezoelectric surgery, the surgical handling required is completely different from that used with the drills and oscillating saws, as the piezoelectric cutting employs microvibrations. It thus follows that in order to increase the capacity of cutting, pressure of the hand should not be increased (as with bone drills or saws), since above certain limits, an increase in pressure prevents the microvibration of the insert; the energy not used for cutting is thus transformed into heat which, if prolonged, can cause damage to the tissue. Thus, in order to avoid a surgical obstacle, it is necessary to calculate the pressure according to the speed of the insert. Moreover, the technique is difficult to learn. The effects of mechanical instruments on the structure of bone and the viability of cells are important in regenerative surgery. Relatively high temperatures, applied even for a short time, are dangerous to cells and cause necrosis of tissue. There have been studies about the effect of piezoelectric surgery on bone and the viability of cells., Not only is this technique clinically effective, but also histological and histomorphometric observation of postoperative wound healing and formation of bone in experimental animal models has indicated that the response of tissue is more favorable after PS than after conventional bone-cutting techniques with diamond or carbide rotary instruments. The result of a histologic comparison of the effect of a standard ultrasonic insert to a rotary bur and a surgical chisel was published in 1975. The ultrasonic insert, like the surgical chisel, was found to cut and not burnish bone. While the rotary bur was observed to produce the smoothest surface of bone, the rate of bone healing proceeded best when the bone was removed by a surgical chisel or ultrasonic insert. In a follow-up study, 17 of clinical and histologic observations using ultrasonic instruments in the surgical removal of teeth and osseous surgery, ultrasonic inserts were found to remove bone with ease and preciseness. There was no evidence of detrimental histologic changes. In a study by Vercellotti et al., a modulated-frequency piezoelectric knife was investigated as a means of performing ostectomy and osteoplasty. The rate of postoperative level of bone change was used to compare the effectiveness of this instrument with a standard carbide bur and a standard diamond bur and the results indicated that PS provided a more favorable osseous response than traditional carbide and diamond burs when surgical ostectomy and osteoplasty procedures were performed. Because the PS insert vibrated within a width of 60–200 mm at a modulated ultrasonic frequency, an increase in temperature was avoided that eliminated bone damage. Ultrasonic osteotomy preserves the bone microstructure which facilitates bone healing and, in turn, osseointegration, which is the key to implant success. Research has shown that the healing process after the surgical procedure is facilitated with the use of piezoelectric surgery and reduces inflammatory reaction when the graft is healing, which helps in stabilizing the live bone tissue after it has been grafted. Bone block grafting performed with piezoelectric surgery is a more precise and gentle technique compared with the same procedure carried out with rotary instruments. Studies conducted by Majewski have shown that, with the use of piezoelectric surgery, it was possible to more accurately harvest the correct shape of block for a ridge defect and to stabilize it in the recipient site, finally allowing the shaping and contouring of the cortical part of the graft. Majewski also observed that piezoelectric surgery was used to delicately shape and thin a layer of cortical block that could serve as an element supporting the shape of the reconstructed alveolar process. Another hypotheses stated by the author includes PS tips do not generate pressure and vibrations in the bone when it is being prepared whereas it is difficult to perform with the rotary instruments. 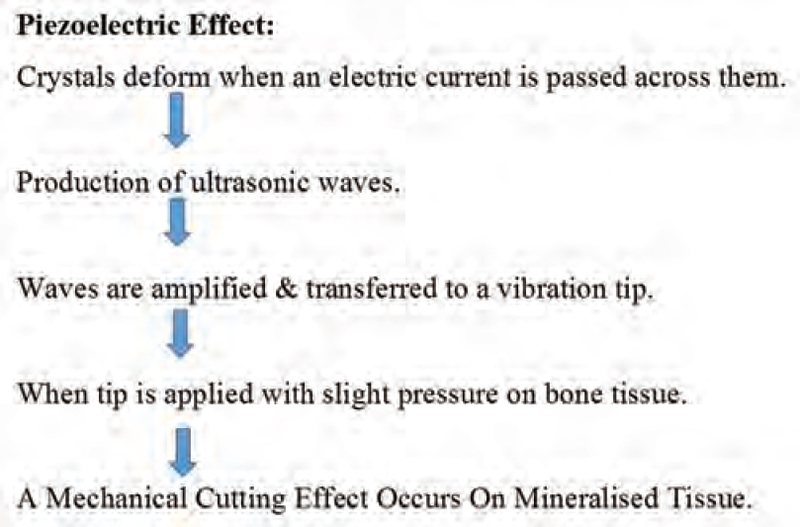 The piezoelectric knife is effective in removing mineralized tissues. Studies have shown its use in ridge expansion to place dental implants and also to perform sinus lift procedures. The advantage of this technique is the ability to cut the bony window with simplicity and precision, thereby avoiding the risk of perforating the membrane as a result of the shape of the bone scalpels working with ultrasonic modulating vibrations. Further use of piezoelectric elevators lifted the membrane without heightened risk of perforation even in anatomically complex situations. Piezosurgical site preparation provides similar primary stability and short-term survival rate of an implant when compared with conventional site preparation techniques. Stelzle et al. emphasized that the applied load on the handpiece may increase the preparation speed but it may also increase the negative thermal effect on the bone. Wallace et al. conducted a study in which one hundred maxillary sinus surgeries were performed using the piezoelectric device. Only seven cases of perforation of the sinus mucosa were observed. None of these perforations occurred because of the inserts of the piezoelectric unit and all of them were caused by the subsequent elevation of the Schneiderian membrane with hand tools. Perforations occurred due to the presence of bony septum (four cases) and by manipulation of extremely thin membranes (three cases). PS is suitable to collect the bone particles with optimal size and low heat generation, thereby minimizing the possibility of thermal necrosis. A feature of the use of PS is the significant amount of surviving osteoblasts and osteocytes in bone blocks removed by ultrasonic surgery, besides that the clinical outcomes sometimes cannot be seem when compared to surgery with rotary instruments. Gonzalez-Garcia et al. conducted a study of 17 vertical alveolar distractions in the posterior region of the mandible, seven in the right side and ten in the left side. The results were compared between two approaches: Conventional technique and piezoelectric technique. After analyzing several criteria, the authors concluded that the use of piezoelectric osteotomy in osteogenic distraction to increase the alveolar ridge height prior to the installation of dental implants is easier for the surgeon and less prone to intraoperative complications compared with conventional osteotomy procedures. Overall, the patient's response is significantly improved as compared to traditional instrumentation also piezoelectric surgery resulting in favorable osseous repair and remodeling which encourages the clinicians to include this method to their armamentarium. PS is a promising, highly precise, and safe bone-cutting system that is based on ultrasonic microvibrations which are optimally adjusted to target only mineralized tissue and spares soft tissue, nerves, and vessels. The precise nature of the instrument allows exact, clean, and smooth cut geometries during surgery. If used judiciously, this could be of great help in performing precise bone surgeries. Seshan H, Konuganti K, Zope S. Piezosurgery in periodontology and oral implantology. J Indian Soc Periodontol 2009;13:155-6. Bains VK, Mohan R, Bains R. Application of ultrasound in periodontics: Part II. J Indian Soc Periodontol 2008;12:55-61. Labanca M, Azzola F, Vinci R, Rodella LF. Piezoelectric surgery: Twenty years of use. Br J Oral Maxillofac Surg 2008;46:265-9. González-García A, Diniz-Freitas M, Somoza-Martín M, García-García A. Ultrasonic osteotomy in oral surgery and implantology. Oral Surg Oral Med Oral Pathol Oral Radiol Endod 2009;108:360-7. Stübinger S, Kuttenberger J, Filippi A, Sader R, Zeilhofer HF. Intraoral piezosurgery: Preliminary results of a new technique. J Oral Maxillofac Surg 2005;63:1283-7. Bains VK, Mohan R, Gundappa M, Bains R. Properties, effects and clinical applications of ultrasound in periodontics: An overview. Periodontol2000 2008;5:291-302.
da Silva Neto UT, Joly JC, Gehrke SA. Clinical analysis of the stability of dental implants after preparation of the site by conventional drilling or piezosurgery. Br J Oral Maxillofac Surg 2014;52:149-53. Rahnama M, Czupkallo L, Czajkowski L, Grasza J, Wallner J. The use of piezosurgery as an alternative method of minimally invasive surgery in the authors' experience. Wideochir Inne Tech Maloinwazyjne 2013;8:321-6. Koszowski R, Morawiec T, Bubilek-Bogacz A. Use of the piezosurgery technique for cutting bones in the autotransplantation of unerupted third molars. Int J Periodontics Restorative Dent 2013;33:477-81. Torrella F, Pitarch J, Cabanes G, Anitua E. Ultrasonic ostectomy for the surgical approach of the maxillary sinus: A technical note. Int J Oral Maxillofac Implants 1998;13:697-700. Vercellotti T. Piezoelectric surgery in implantology: A case report – A new piezoelectric ridge expansion technique. Int J Periodontics Restorative Dent 2000;20:358-65. Vercellotti T, De Paoli S, Nevins M. The piezoelectric bony window osteotomy and sinus membrane elevation: Introduction of a new technique for simplification of the sinus augmentation procedure. Int J Periodontics Restorative Dent 2001;21:561-7. Preti G, Martinasso G, Peirone B, Navone R, Manzella C, Muzio G, et al. Cytokines and growth factors involved in the osseointegration of oral titanium implants positioned using piezoelectric bone surgery versus a drill technique: A pilot study in minipigs. J Periodontol 2007;78:716-22. Happe A. Use of a piezoelectric surgical device to harvest bone grafts from the mandibular ramus: Report of 40 cases. Int J Periodontics Restorative Dent 2007;27:241-9. Sohn DS, Ahn MR, Lee WH, Yeo DS, Lim SY. Piezoelectric osteotomy for intraoral harvesting of bone blocks. Int J Periodontics Restorative Dent 2007;27:127-31. Horton JE, Tarpley TM Jr., Wood LD. The healing of surgical defects in alveolar bone produced with ultrasonic instrumentation, chisel, and rotary bur. Oral Surg Oral Med Oral Pathol 1975;39:536-46. Horton JE, Tarpley TM Jr., Jacoway JR. Clinical applications of ultrasonic instrumentation in the surgical removal of bone. Oral Surg Oral Med Oral Pathol 1981;51:236-42. Vercellotti T, Nevins ML, Kim DM, Nevins M, Wada K, Schenk RK, et al. Osseous response following resective therapy with piezosurgery. Int J Periodontics Restorative Dent 2005;25:543-9. Rashad A, Sadr-Eshkevari P, Weuster M, Schmitz I, Prochnow N, Maurer P. Material attrition and bone micromorphology after conventional and ultrasonic implant site preparation. Clin Oral Implants Res 2013;24 Suppl A100:110-4. Chiriac G, Herten M, Schwarz F, Rothamel D, Becker J. Autogenous bone chips: Influence of a new piezoelectric device (Piezosurgery) on chip morphology, cell viability and differentiation. J Clin Periodontol 2005;32:994-9. Majewski P. Piezoelectric surgery in autogenous bone block grafts. Int J Periodontics Restorative Dent 2014;34:355-63. Stelzle F, Frenkel C, Riemann M, Knipfer C, Stockmann P, Nkenke E. The effect of load on heat production, thermal effects and expenditure of time during implant site preparation – An experimental ex vivo comparison between piezosurgery and conventional drilling. Clin Oral Implants Res 2014;25:E140-8. Wallace SS, Mazor Z, Froum SJ, Cho SC, Tarnow DP. Schneiderian membrane perforation rate during sinus elevation using piezosurgery: Clinical results of 100 consecutive cases. Int J Periodontics Restorative Dent 2007;27:413-9. Berengo M, Bacci C, Sartori M, Perini A, Della Barbera M, Valente M. Histomorphometric evaluation of bone grafts harvested by different methods. Minerva Stomatol 2006;55:189-98. González-García A, Diniz-Freitas M, Somoza-Martín M, García-García A. Piezoelectric and conventional osteotomy in alveolar distraction osteogenesis in a series of 17 patients. Int J Oral Maxillofac Implants 2008;23:891-6.